(15 May 2017) This issue will rig a lugsail. The 1 June issue will start a series about rowing. Bob Holley's AF4B project back underway after a shoulder surgury. This applies to any sort of sail rig. For proper sailing the sail rig forces need to balance around the hull forces. Look closely at Figure1 and see that the center of the sail area is placed right above the center of the leeboard's area. For boats like mine with shallow underbodies and deep narrow boards this is the way it has to be. You can't tinker very much with this if at all. Here is what happens. In general you can think of the force of the wind as a giant finger pushing at the sail's center. Opposing that force is a giant finger pointing the other way at the center of the leeboard. The hull tends to rotate about that deep narrow board. So if those two forces are in vertical line the boat will not try to rotate and will in general maintain its heading. 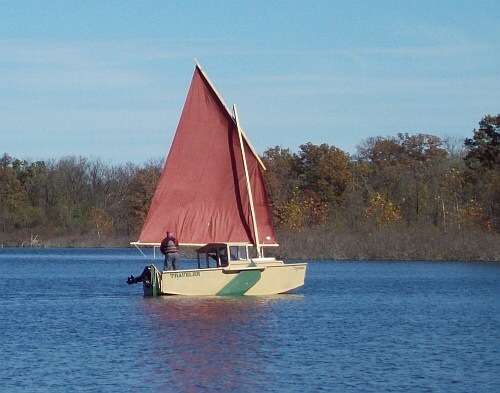 If the center of sail area is moved aft of the leeboard, the boat will rotate into the wind if left on its own. To keep the boat on course the skipper needs to tug on the tiller as shown in the top of Figure 2. This is called "weather helm". Weather helm reduces the load on the leeboard and should result in a faster boat. If the skipper falls overboard the boat should rotate into the wind and stall and with luck wait for the skipper. A light weather helm is considered to be ideal. 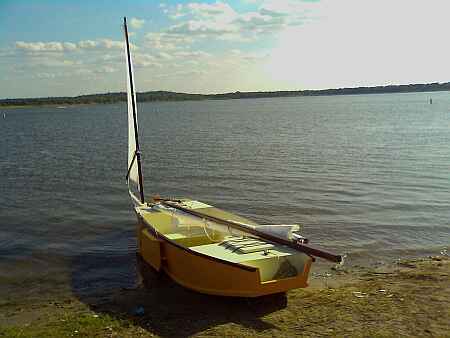 Now take the case of the builder who modifies the rig so that the sail area centers forward of the leeboard. This might be by changing to a rig style with a jib, or perhaps by relocating the mast forward. Now the two opposing giant fingers on sail and leeboard are not in a vertical line and the boat will want to rotate around the leeboard bow going downwind. 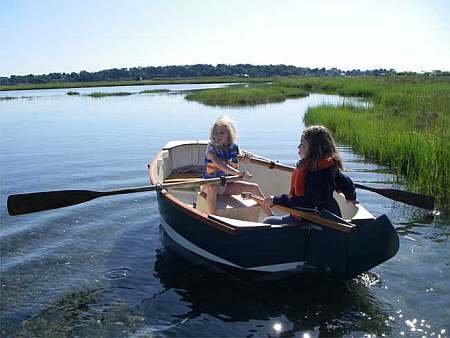 To hold the bow on course the skipper must correct by pushing the tiller as in the bottom of Figure 2. This is called "lee helm". Lee helm will increase the reaction load on the leeboard. If the skipper falls overboard the boat will turn downwind and take off without him. Lee helm is usually not considered to be good. So the way I like to approach it is to keep the center of the sail area directly above the aft half of the leeboard. You might find lots of variations on the rules that hope to provide proper helm feel. Try them if you wish. 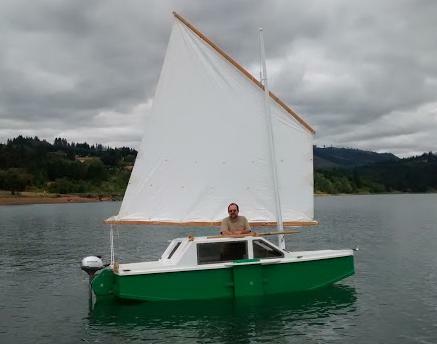 But keep in mind that if you build the boat and it has lee helm, you need to move the sail area aft. If you have excessive weather helm, the sail area needs to be moved forward. I greatly prefer individual ties through the grommets although lacing looks neat. But the individual ties allow for last ditch sail shaping. If you think you needed more round in the head of the sail for example, you could make the ties in the center of the yard tighter than those on the ends. Also, a failure of a tie or two is of little consequence where a failure of a lacing line will be total. One important note. The ties in the corners take most of the load. They should be tied as shown in the figure in two directions. As you see, the balanced lug sail pivots around the mast. I guess all sails do. But the balanced lug has the mast running through its middle somewhere, as do other Lugsails, junk sails and lateens. While the mast may interfere somewhat with the aerodynamics of the sail, great benefit is gained in proper "balance" of the sail areas that are in front of the mast. In particular if things are properly placed, the sail will twist less than similar sails that use the mast as a leading edge. As a result the lug is a low tech sail that can be more efficient to windward than you might expect. One trick to rigging these efficiently is to get the "balance" correct. By my experience the yard should be hoisted about 40% aft on the yard. If you hoist farther forward than that you will get harmful sail twist when sailing to windward. Hoisting too far aft can make the sail uncontrollable. I have often seen in the older literature the advice to hoist at 33% aft. That will work OK but it has been my experience that all the stretches and sags in the system conspire to pull the sail aft with respect to the mast. So if you tie the halyard to the yard at 40%, in use the sail swings aft very close to that 33% value. We need to rig the halyard so the sail stays near that 40% position by binding it somehow to the mast. This is especially important while reefed or while in rough water that will force the yard to pump back and forth on the mast. I know of three suggestions. First for small simple boats that won't be reefed the best solution is to run the halyard through a simple hole in the top of the mast, tie it to the 40% position on the yard, and hoist solidly to the top of the mast. There must be a small amount of slack at the masthead of course to allow the yard to swing but that will appear automatically when you tension the sail with the tack line. Second you can try the tightening noose system shown in Figure 3. Here the halyard runs in a loose loop around the mast before going to the masthead. It will stay loose until the yard is hauled up all the way. Then additional tension in the halyard constricts the noose (until it hits the stopper knot) and secures the yard to the mast. You will need rollers on the noose to keep the halyard from binding on the mast. I have a feeling that this is the most reliable system. Third method works well with round and slippery masts. A loose slippery ring is simply dropped over the halyard and mast. I use this system on my Piccup Pram using a section of large PVC pipe as a ring. Figure 5 shows the tack arrangement I prefer. As with the yard, the boom must be secured to the mast to prevent pumping in rough water. The actual location of the tack on the yard is not too important. In fact if it were at the very front of the boom you would have a standing lug. The standing lug is probably easier to rig and reef than the balanced lug but in my experience lacks the great manners of the balanced lug in sailing downwind. The boom has a small cleat on it with a lanyard that wraps around the mast to locate the boom fore and aft. That loop should be fairly loose to allow easy up and down motion of the boom. This loop needs to be set up before the yard is hoisted to prevent the sail from blowing around and making a spectacular and dangerous kite during hoisting. The actual tack line I prefer is a simple line that runs from the mast step over the boom and down to a cleat at the step. So with the boom loop attached, the yard is hoisted, then the tack line is passed over the boom, pulled very very tight, and cleated. In effect you have now a two to one tackle. All sail tensioning is done with the short and handy tack line and not with the halyard. On my Piccup I run the tack line through a cam cleat to allow for quick adjustment although I don't consider that to be as secure as the good old jamb cleat. In my opinion the tack should always secure to the hull and not to the mast. Securing the tack to the hull will secure the entire mast and rig to the hull in event of a capsize. Here is some advice about how much to tension the tack line. It varies with wind strength. Look at the sail as you do it. See Figure 6. As you tension the sail with the force of the wind in the sail, stress folds called girts will appear in the sail. If the girt runs from throat to clew you need more tension. If the girt runs from head to tack you either have it right or can reduce the tension. A perfect setting will have no girts. Usually at the initial setup I put in a good girt from peak to tack. Then I watch it while sailing to see if that girt disappears. Then when convenient I trim as required. Remember that changing sailing conditions will change the tension requirements. Nothing fancy needed here. Almost anything will work. Because the sail is balance already to a great degree the sheet forces are less than with other sail types. Because the tack is pulling down in the middle of the boom, the boom has less tendency to lift so downward pull of the sheet on the boom is of less importance. The location and lead directions of the sheet are of little importance also. It's another advantage of the balanced boom. By the way, if the boom is omitted to make the sail boomless, the sheet location is very critical and its needs change all the time. I think the boom is a great invention! The boom on a balanced lug can be quite light and still work. Watch the leading edge of the sail for luffing, as with about any sail. You should be able to tack through about 100 degrees effectively, although if you are really interested in getting somewhere you might sail it more freely, say up to 120 degrees between tacks, especially if the wind is unsteady. 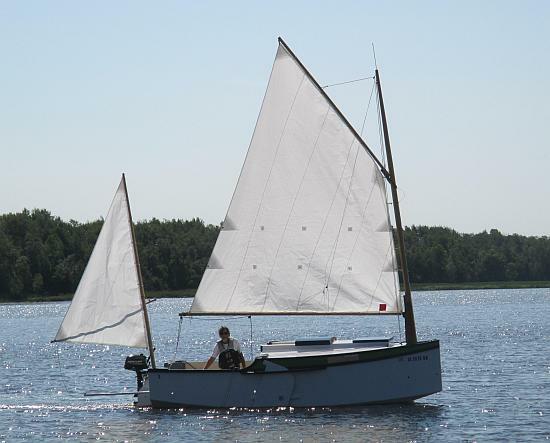 While reaching or running a balanced lug sail, even a cheap polytarp one, will keep up with any conventional sail. Also it should be mentioned that one of the most effective ways to trim the boat, helm-wise, is to rake the mast as required to move the sail area fore or aft. You can see that a small amount of rake will move the mast head quite a bit and the entire sail will go with the masthead. Old time boats had adjustable mast steps or partners. On my designs you can usually shim the mast partner on the bulkhead. It's one place where tinkering pays off. Making a mast a bit longer than shown on the plans is also almost always a good idea as it allows for this tinkering not to mention real life stretch of the rigging. We'll start to discuss rowing. Building Qt was very easy and a great learning experience. I have read Payson's books, so there were no real surprises in this project. As you know, I mostly used hand tools, and really didn't need much else, though the oar I built with a belt sander was quite a revelation. I used a rasp, handsaw and plane which were my grandfather's, so that added something to the experience. Altogether, including making oars and painting, I spent about 60 hours abuilding. I used polyurethane glue, which worked fine, but makes a real mess when it expands into foam, and costs more than epoxy. She was painted with alkyd porch and deck enamel, which gives a very nice finish and should be extremely tough (according to the salesperson). The plywood was AC exterior, the other wood was yellow pine. If I were doing this project again, I would use fir instead of pine, the Weldwood glue as recommended by you, and latex paint since the alkyd takes a long time to cure. Also, I think Grandfather's memory has been honored enough, and I would use a table saw and a belt sander for sure. When I took QT to the water for her first trial, it was quite windy and I hadn't rowed for many years, so our path was pretty erratic. For the next trial, I adjusted the oarlock position up the oars an inch, moved their pivots two inches astern and adjusted my seat to get the level oars at belly button height, per your instructions. It was still pretty windy but the rowing went much better. The next time out, the wind was calm and we went for quite a long way, about 5 miles. I was very impressed with the small rowing effort required with this boat, and we covered the distance easily in about an hour and a half. This testing was all done with my wife and me aboard. As I mentioned to you before, we are both big people. Frankly we had some doubts about quarter inch plywood holding us up, but it seems very sturdy and tolerates us walking on the bottom just fine. Also, we are able to change places and otherwise move around in her OK.
We tried putting our 70 pound grandson in with us and it didn't work well. If he sat in the back, the drag increased noticeably, and if he sat in the front, the stem was immersed and the drag was bad. Our impression was that she does best, given the limited places to sit, with two people of about the same size aboard. I'm sure, though, that all boats need to be balanced to do best. The project has been loads of fun and the most satisfying thing I've done for years. Thanks. 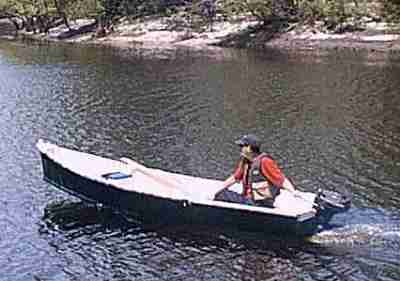 Later Paul reminded me that the idea behind his QT was first to have a boat to carry atop his motorhome. He added, "QT fits very well on our motorhome. I made a simple bow holder from a short piece of 2x6 bolted flat to the roof. It has an outline of the wales routed into it, and I just hook the bow gusset over it. With lines running from eyebolts in the 2x6 to an eyebolt through QT's stem, it ain't going anywhere. The stern is fastened with lines down to the bumper braces and tied to the ladder to prevent lateral movement. The oars fit nicely with my fishing poles in a 10 inch square compartment which goes all the way across the motorhome. My wife and I can have her ready to travel or row in 5 minutes." Well Paul certainly did an excellent job. One comment about his experience. Trimming you and your boat for level operation is very important as he points out. Always take the time to do it. I always give oarlock locations on my drawings but they are just suggestions and don't be shocked if you have to tinker with them to get the boat right. Often you can't tell if the boat is trimmed right without having an observer dockside to advise. If you are rowing solo or with passengers, you will need separate oarlocks for each configuration. When Paul tried to row with his grandson making a crew of three, it didn't work because the boy's weight ended up in the boats ends and threw off the trim. The usual solution would be to put the boy between the two adults, in the middle of the boat. But QT may not really be big enough for three, she's only 13' long. So you get both the rowing plans and the powerboat plans in the same packet. This is a simple nailed together job from three sheets of 1/4" plywood. No jigs, no lofting.